Setting research priorities for the next 10-15 years was the focus of the 2013 U.S. Climate Variability and Predictability Research Program (CLIVAR) Summit held in July. Meeting organizers invited Dr. Tamay Ozgokmen with the University of Miami to present results on ocean processes from his team’s Grand Lagrangian Deployment (GLAD) experiment conducted after the Deepwater Horizon incident to improve prediction models of oil transport. The connection between climate and the GLAD experiment is that processes at the ocean’s upper boundary layer – submesoscales – are an important part for the ocean’s carbon intake, thereby regulating the amount of Greenhouse gases in the atmosphere. Ozgokmen is the director of the Consortium for Advanced Research on Transport of Hydrocarbon in the Environment (CARTHE), funded by the Gulf of Mexico Research Initiative. The CARTHE GLAD experiment was the largest synoptic drifter deployment in oceanography to date and generated 5.7 million data points on submesoscale flows. The Naval Research Laboratory Prediction Group is using these data to improve their forecasts. Understanding submesoscale flows can improve knowledge about energetics of ocean circulation, important for climate modeling as well as interpreting biogeochemical tracer signals visible in the satellite remote sensing images of the ocean surface. In addition to improving models, better knowledge about submesoscale flows can be applied to naval operations that involve acoustics, submerged vehicles, mines, and sensors, and can inform response efforts, such as for oil spills and search and rescue operations. One of Ozgokmen’s observations from the summit is that while there is much emphasis on deep ocean processes, these are also very slow and challenging to observe and understand. Ozgokmen suggested during the discussions that one of the priority areas in climate modeling should be surface processes near coastal areas – where the majority of people on the planet live and where the ultimate effects of global warming are being felt – to make US CLIVAR research more directly relevant to the public and future mitigation efforts. Five Federal agencies support U.S. CLIVAR research programs: National Aeronautics and Space Administration, the National Oceanic and Atmospheric Administration, the National Science Foundation, the Department of Energy, and the Office of Naval Research. Program managers from these agencies coordinate and target funding and resources to support the U.S. CLIVAR research activities. Four of these agencies sponsor the U.S. CLIVAR Project Office to coordinate science planning, implementing research activities, communicating research advances and needs, and supporting international engagement and collaboration. For more information about CARTHE, visit their website at www.carthe.org. 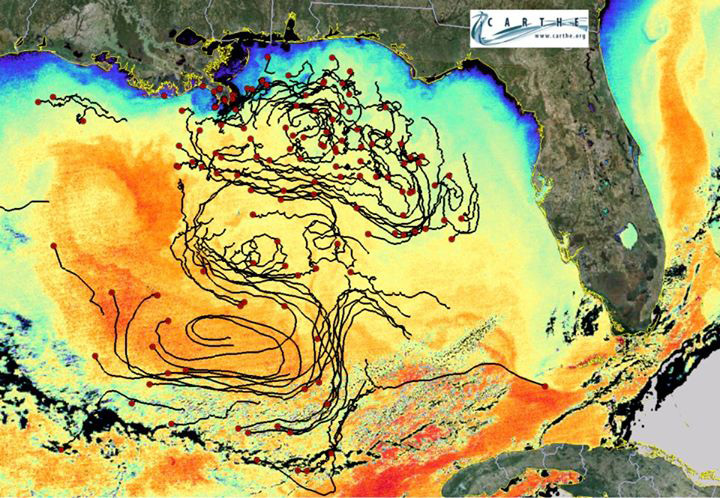 CARTHE is one of eight research consortia funded by the Gulf of Mexico Research Initiative (GoMRI). The GoMRI is a 10-year, $500 million independent research program established by an agreement between BP and the Gulf of Mexico Alliance to study the effects of the Deepwater Horizon incident and the potential associated impact of this and similar incidents on the environment and public health.